Manufacturer of a wide range of products which include weight indicators. 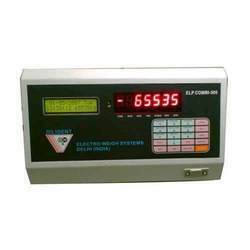 Weight indicator (Intelligent Terminal) is a compact and powerful alphanumeric terminal, designed for numerous weighing applications. These weight indicators are available in friendly configuration and operation to meet the most demanding needs. The weight indicators supplied by us are known for providing speedy and accurate measurements. Looking for Weight Indicators ?